Secretary of State John Kerry announced on Sunday his keen attention to the developments in Egypt and confirmed his confidence in the safety of the U.S. embassy in Cairo as well as its staff. 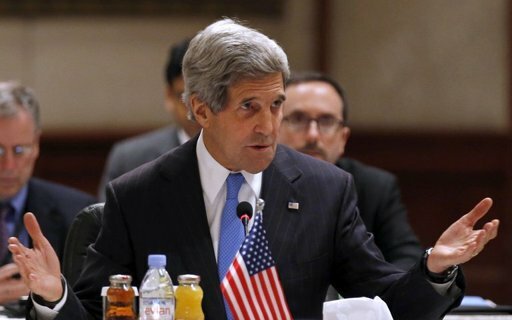 “Egypt is a great concern to all of us,” Kerry said, explaining that he held talks with Gulf country leaders about the political situation in Egypt, in addition to Egyptian politicians Mohamed ElBaradei and Amr Moussa. He also extended his condolences again to the family of Andrew Pochter, an American who was stabbed to death during Friday’s violent demonstrations in Alexandria. Kerry added that on the same day of Pochter’s death the American embassy had issued an alert to Americans in Egypt, warning them of the possible dangers of the demonstrations and urging them not to participate. U.S. President Barack Obama also commented on the current events in Egypt, according to the Agence France Presse (AFP). At a press conference in Tanzania on Monday, he said “everybody has to show restraint,” adding that assaulting and harassing women at protests is not considered peaceful. Obama did not say whether he supports President Mohamed Morsi, but urged him to work with the opposition, ensure the implementation of the rule of law and work on a legitimate process. “What is clear right now is that although Mr. Morsi was elected democratically, there is more work to be done to create the conditions in which everybody feels their voices are heard,” he concluded. The foreign ministry of Germany released a statement on Monday about the current situation in Egypt, issuing an update on travel and safety recommendations.